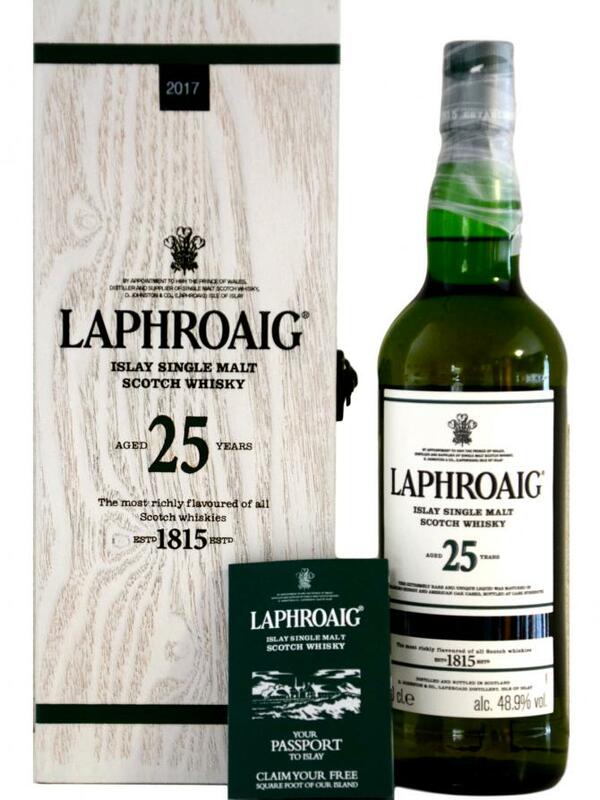 The colour is yellow gold and the nose offers an almost perfectly balanced profile of maritime peaty, fruity, barley sugary, spicy and herbal aromas with not a single off-note. The wood is just about right to provide an appropriate backbone for the distillate's flavours but it never dominates. After some breathing more peaty aromas pop up that are very delicious in combination with the sweet fruity and sugary flavours. 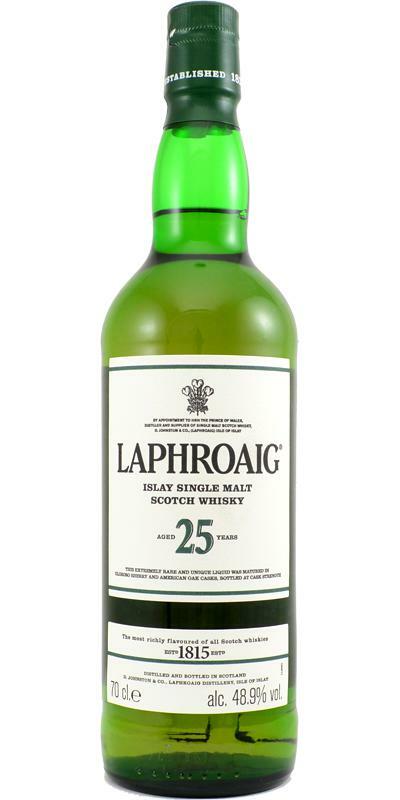 The taste is multi-layered and shows Laphroaig at its best - first there is an overwhelming sweetness of ripe fruits and barley sugars that immediately is countered by an attack of dry peaty flavours (cold smoke, medicinal notes). Later spices and herbs enter the stage together with tobacco and tea leafes. There is much more to detect in this truly complex profile so take your time and chew this dram as long as you can withstand the temptation to swallow it. 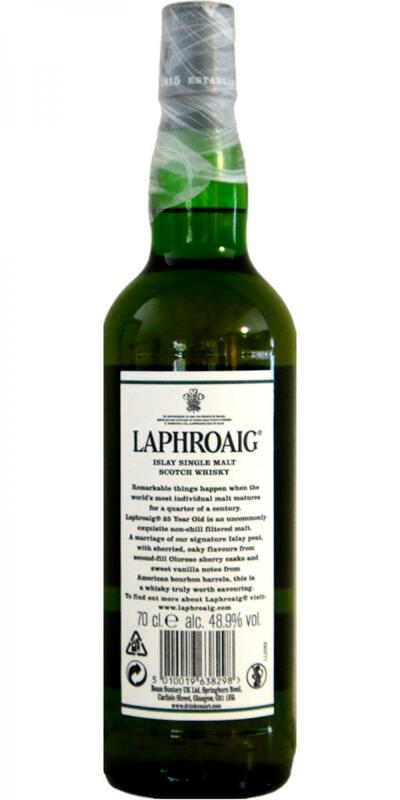 Water turns both the nose and taste smoother and hence even more quaffable - but nevertheless I like the neat dram best. The initial mouthfeel is charming and warming and coats the whole of the mouth with just a minor drying moment (tannins). The finish is long and adds more smokey flavours (bonfire, tobacco smoke) that are tasty in this setting. There is a drying-astringent feeling towards the end of the finish but this just drives you to serve your taste buds the next dram (which is very dangerous for your bank account, indeed!). Very much to my li(c)king. One extra point because I was looking forward to a new Laphroaig bottling of this quality, having been a little (...) disappointed by most of the recent ones. Considering the price explosion, this one stays just about affordable. At least when comparing to the 27y limited edition. Ooops, forgot to add water. You know what ? Forget it too, it simply doesn't need any. Fruits, brime and a little hint of smoky chocolate (somebody needs to invent that) lingering behind. Nice roundness, alcohol well hidden. 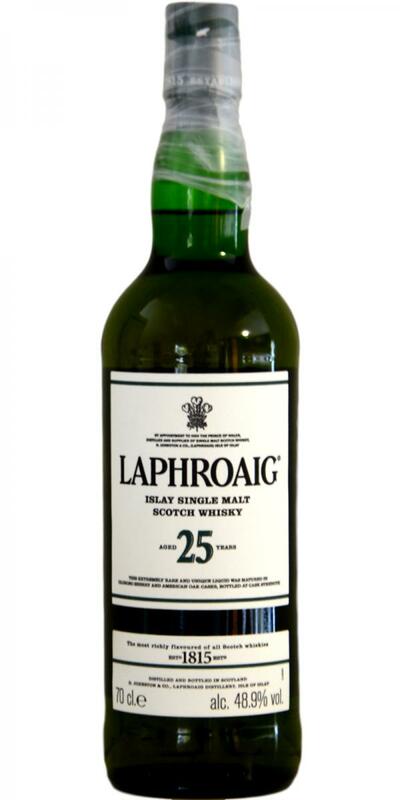 Aaaargh, finally I found it back, the really, really good, old Laphi-feeling, and - of course - it had to be an expensive one : Peach, brime, a little ... vanilla, white pepper and smoke. Then some apple with cinnamon with just one drop of lemon. Smoked Apple cider with a little ooomph, someone ? Long and nice. Smoke, pepper, cinnamon and citrusy apple (maybe a hint of pineapple ? ).